Home > NATIONWIDE > FOOD > KitKat: How many flavors do you know? For us Americans, KitKats are a pure nostalgic treat. The simple wafer dipped in delicious chocolate, brings back memories of Halloweens and birthday parties. For most of my life, I always thought that KitKats could not get any better. Then Japan goes and proves me wrong! While in America KitKats come in one simple flavor: chocolate. But in Japan you can get Kit-Kats in almost any color and flavor imaginable. Strawberry, Green Tea, Cheese Cake, Baked Potato, Fruit Parfait, Cherry, Soy Bean, White Peach, and even Brandy! 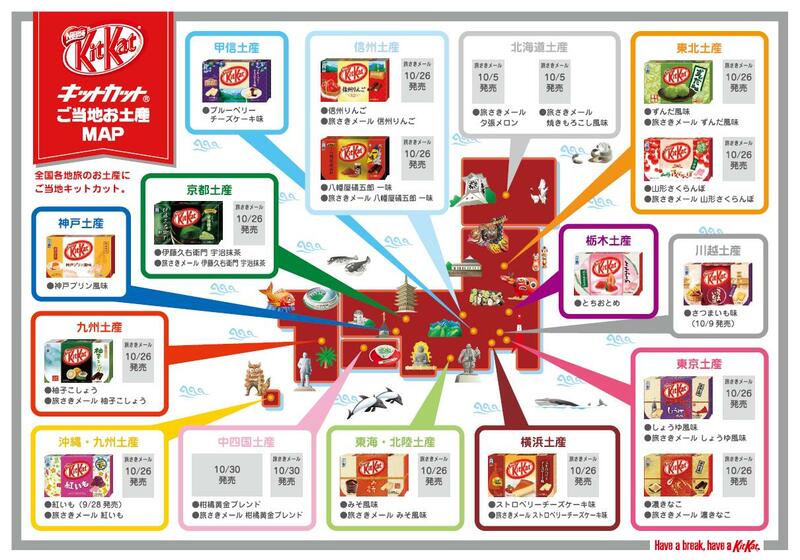 Most flavors of KitKats in Japan are only available for a limited time. Usually each year Nestle will produce a few new flavors which will only be produced for a short time. I highly recommend buying as many as you can while you can, because you might never see them again. Furthermore, certain flavors are only available in specific areas of the country, made with ingredients particular to that region. Another great reason to tour as many cities as you can! KitKats are insanely popular in Japan. They are the most popular chocolate in the country. So popular in fact that Nestle opened the first ever KitKat boutique in the Seibu department store in Ikebukuro, Tokyo. The store will be called Chocolatey, and will exclusively feature three flavors created by famous Japanese chocolatier Takagi. These three flavors are Sublime Bitter, Special Sakura Green Tea, and Special Chilli. 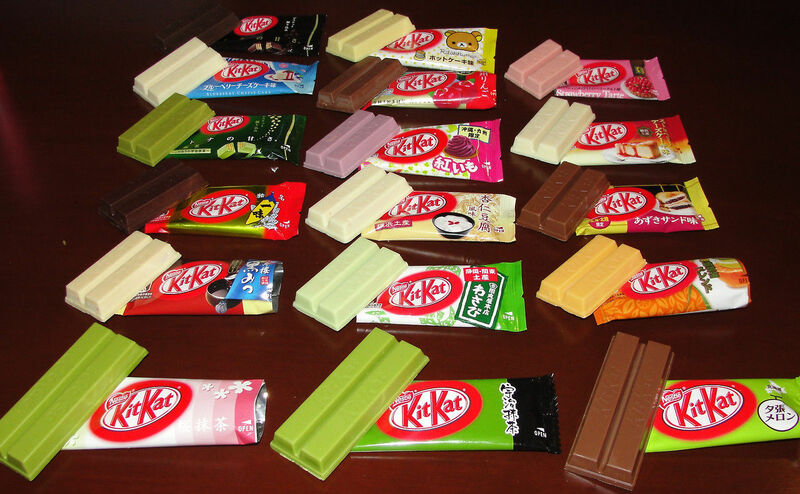 You can find regular flavors of KitKats at convenience stores, drug stores, and discount candy stores. To get special flavors, you should visit souvenir shops. Airport souvenir shops are especially good because they might have KitKats available in other areas as well. These special flavors make perfect souvenirs for friends and relatives, children will like the original flavor and adults will enjoy many of the flavors that cater to a more adult palate.